ANDRITZ HERB™* recovery boilers for kraft mills are designed to achieve a high power-to-heat ratio to maximize both chemical recovery and energy generation from the recovery process. The boilers feature a unique vertical air system to minimize air emissions. Rising energy costs and the potential uncertainty of a steady energy supply are causing pulp producers to re-think their overall energy strategy. Critical to that strategy is the chemical recovery boiler, a major energy generator and the heart of the kraft chemical recovery process. Thermal energy from kraft black liquor is regarded as CO2 neutral, plus the “fuel” supply is renewable and sustainable. 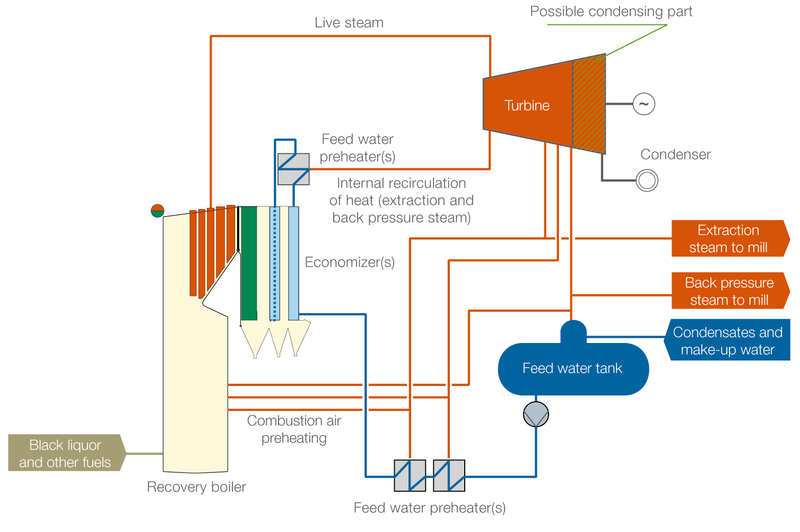 The ability of a HERB recovery boiler to produce surplus energy in excess of what the mill needs, which can be sold as “green” energy, is an economic advantage. ANDRITZ HERB recovery boilers are well-proven in their ability to maximize the production of thermal energy while efficiently recovering cooking chemicals at the same time. They can achieve the highest power-to-heat-ratios from the recovery process. They also operate efficiently with limited emissions. ANDRITZ HERB recovery boilers utilize a unique, patented Vertical Air system that thoroughly mixes the air surrounding the combustion process so that the recovery furnace operates more efficiently. The furnace can be operated with a smaller amount of excess air, which lowers the amount of flue gas created and the power consumption of the fans. Reduced excess air, and the proper staging of combustion air, contribute to a significant reduction in NOX. If strict NOX emission limits are required ANDRITZ can provide the most advanced secondary NOX reduction technology, SCR, for a recovery boiler. NOX removal rates up to 95% can be achieved. The ANDRITZ HERB boiler recovers heat from flue gases after the electrostatic precipitator. Additional cooling of the flue gases results in substantial savings in auxiliary fuel consumption. As an alternative, increased electricity production can be achieved. All Dilute Non-Condensable Gases (DNCG) collected from the pulp mill, together with the dissolving tank vent gases, can be effectively and efficiency burned in the ANDRITZ HERB recovery boiler in order to significantly reduce mill odors with minimal emissions to the atmosphere. For DCS checkout, loop verification, and training of operators prior to start-up of an ANDRITZ HERB recovery boiler, ANDRITZ can supply its IDEAS Dynamic Simulator. Operating the simulator is identical to operating the DCS of the actual boiler, with the only difference being that the simulator performs in a safe, virtual environment where operational mistakes can be safely tolerated. Operators can become proficient in starting up, making setpoint changes, and managing disturbances before the boiler is operational – so that the actual start-up and ramp-up can be done in the shortest time possible. ANDRITZ also offer its Recovery Boiler ACE™* (Advanced Control Expert) software that optimizes the control and operation of any kraft recovery boiler. ACE is an advanced control solution for recovery boiler combustion and sootblowing optimization. ACE manages all aspects of recovery boiler operation while communicating its actions to the operator. ACE helps make sure that production goals are met and the operating costs are kept at lowest possible level. * Trademark of the ANDRITZ GROUP. For information regarding ownership and countries of registration, please visit www.andritz.com/gr-trademarks. Night at Montes del Plata, Uruguay.